Your privacy is important to you. That’s why it’s so important to us. When you make new discoveries with us, we want you to be confident that we are good stewards of your personal information. Our customers have trusted us with personal information for over 20 years—and we’re committed to helping ensure you feel just as secure today. Your trust is our top priority. Whether it’s your family history or your DNA data, we always strive to manage your personal information with integrity and respect. Earning your trust as we protect your privacy is at the core of what we do every day. Being transparent to avoid confusion and surprise. Simplifying our policies and making your choices clear. Making sure you have control of your own data. You're at the center of the AncestryDNA story. your privacy first all along the way of your DNA experience. How do we help ensure you have control of your data? learn AncestryDNA policies and processes to keep your data safe. Learn how our policies put transparency, simplicity, and control into action for you. Ancestry primarily uses information about you to provide, personalize, improve, update and expand and improve our services to you. For example, we use information about you to create your account, deliver our websites and services, help you build a family tree, and perform tests on your DNA. We may also use your information in genealogical or genomic research projects, to improve or develop new products and services, and for internal business purposes. We may also use personal information about you to verify your identity, communicate with you and to deliver advertisements, improve Ancestry information security; help you create, and providing insights about, your family trees based on data in Ancestry’s databases; issuing surveys and questionnaires to collect additional user information for use in the Services, marketing new products and offers from us or our business partners, conducting scientific, statistical, and historical research; detecting and protecting against error, fraud, or other criminal or malicious activity as well as facilitating product development and research initiatives. See our Privacy Statements (in Important Resources below) for more details. Ancestry does not share your individual Personal Information (including your Genetic Information) with third-parties without your additional consent other than as described in our Privacy Statement. Sharing might occur with any information you add to your Ancestry profile which will be seen by other Ancestry members, or for example if you make your family tree public, share your DNA results, or consent to participate in our Research Project. To be clear, we do not share common identifying information linked to your genetic or health data with third parties unless we obtain your explicit consent or are required to do so. Otherwise, we share information as described in our Privacy Statements, such as with our affiliated companies, other users, our service providers, our advertising partners, and in other limited scenarios, such as in response to valid legal process or as appropriate to protect the rights, property, safety, confidentiality, or reputation of Ancestry, our affiliates, and our users. For AncestryDNA, you can review and update your information on your DNA settings page. If you agreed to the Informed Consent to participate in research, and then withdraw consent, we will stop using information about you for the Research Project and any future research. However, information cannot be withdrawn from studies in progress, completed studies, or published results. If you have questions about how to review, update, or delete information, you should look in the “Manage Your privacy” pages below, or contact our Member Services team. If you agree to the AncestryDNA Informed Consent, your DNA and other data that you provide us through questionnaires or surveys may be used in research to further understand human history and improve human health. Ancestry maintains a comprehensive information security program designed to protect our customers’ Personal Information using administrative, physical, and technical safeguards based on the sensitivity of the Personal Information collected. We use industry standard security practices to store your DNA sample, your DNA test results, and other health information you provide to us, and we limit access to authorized individuals who complete privacy training. We store your DNA test results and DNA sample without your name or other common identifying information such as your address. We do not share with third parties common identifying information linked to your genetic or health data except as legally required or with your explicit consent. You own your DNA data and you can ask us to remove your data from our systems at any time. We do not keep copies unless you have consented to participate in research, in which case only those research projects that are ongoing or completed will contain your data. You can also add additional personal information (such as gender, age, and occupation), a photo, location, research interests, and more to your profile. For more information and instructions, see our Support Centre. What are my privacy settings with AncestryDNA? Throughout your AncestryDNA experience, we want to ensure that you understand your privacy settings and how much content you are making public. Below are some ways that you can control the privacy settings of your AncestryDNA account and DNA results pages. You may use your Ancestry username or your real name. Your real name is selected automatically when you create your Ancestry account. 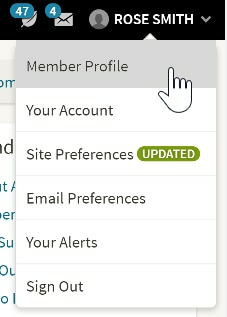 You can update your setting from your Member Profile. You can edit your Ancestry username anytime from Your Account (but remember this change will be reflected throughout the Ancestry website, so editing this will also affect how you log in). For more information go to "How are living people protected by AncestryDNA?" (below). Family tree: You can choose whether or not to link your DNA test to an Ancestry family tree. Learn more about linking your DNA results with your family tree on the AncestryDNA FAQ page. Have questions about your Ancestry family tree? Learn about the difference between public, private, and unindexed trees and how living people are protected in your tree. Deleting your test results: If you desire, you can choose to delete your DNA test results. Access to test results: If you are the person who activates a test for yourself on our website, then you will be the Owner of that test, and you will have control over who has access to the DNA results of that test. As the Owner of a DNA test, you can share your ethnicity results with other users. In addition, as the Owner of a test, you can also invite other users to access your DNA results, which will give those users permission to see your DNA results and, in certain cases, edit some of your information. For more information on how to give other users access to your DNA results, please click here. For more information on your Ancestry profile and personal information go here. How are living people protected by AncestryDNA? There is no “search” for people with DNA test results — You can only see if another person has taken the AncestryDNA test if we determine you are a potential match or otherwise related, or if someone has invited you to access their DNA test results. In addition, if you invite another user to access your DNA test results, they will also see information about your potential DNA matches. You are identified by your display name — To configure how you are identified to matches, click on "Settings" on the DNA status page and adjust your display name. Tests managed by the parent or legal guardian of a minor child will show the parent or legal guardian as the “Manager” of the test. Only the child’s initials will be viewable by DNA matches along with the parent’s display name. The minor will become the “Owner” upon reaching the age of majority and at that time, as Owner, can choose their own display name. Example of how a username can be anonymous. 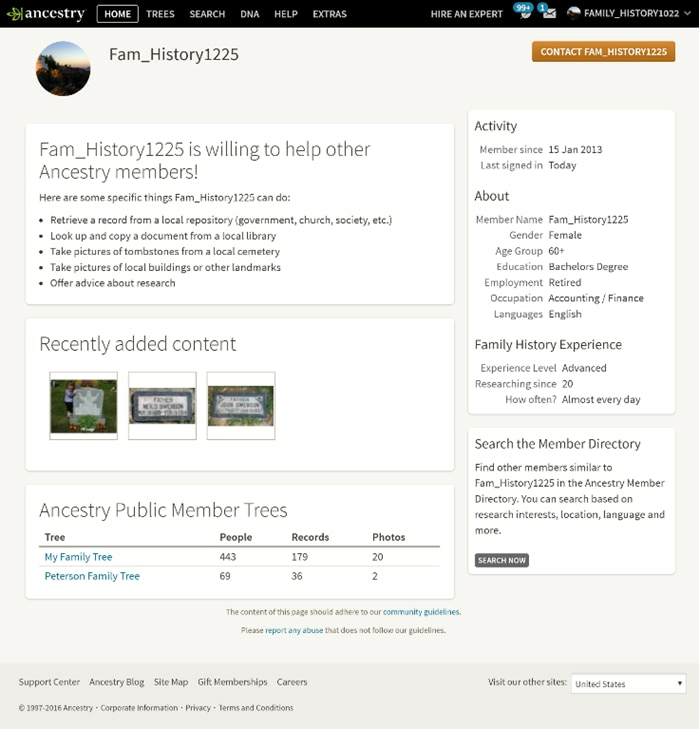 Notice the name of the AncestryDNA user is shown only by their username, “Myfamilyhistory32”. Example of how a DNA match will appear if they do not have an Ancestry account. 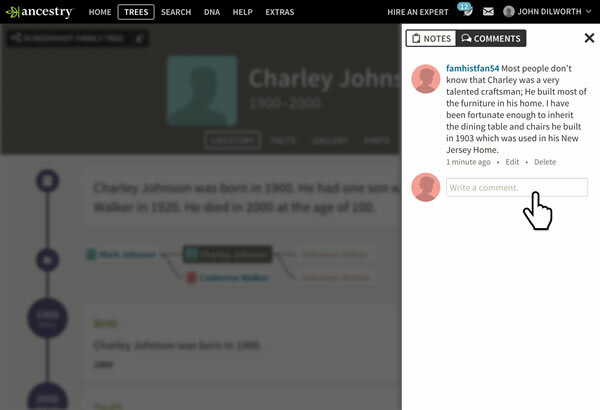 Notice the name of the AncestryDNA user is shown only by their initials, “M.J.”. How are living people protected in family trees? If you find a record of yourself or a living family member that you are uncomfortable with, please contact Member Services. How is my DNA data protected? The results of your DNA test are stored in a secured database — Your AncestryDNA results are stored in a secured database, which employs a number of security measures. As well as protecting the information from unauthorized access from those outside of AncestryDNA, we strictly limit access to this database from within the company. How does Ancestry keep personal information safe? We require a unique username and password to sign in to your Ancestry accounts. In addition, only you, or those you have authorized, can edit your online tree. Learn more about who can edit content in your tree. Learn about your how your DNA data is protected, your AncestryDNA privacy settings and how we protect living people. If you experience any bizarre behavior or suspect that your account has been compromised please contact us at fraud@ancestry.com or through https://support.ancestry.co.uk/s/contactsupport. We will never ask you to disclose your password to us or anyone else, and you should not share it with anyone. We recommend that you change your password periodically. A strong password contains a mix of numbers, letters, and symbols and is only used for this account—and remember, especially given the nature of our sites, using your own or your relatives’ names or dates of birth is not a good idea. Also, you should log out of Ancestry when you use a computer you share with other people. Access Your Account page to change your password. Ancestry has several security methods in place to prevent fraud and protect payment information. For example, we encrypt financial information. 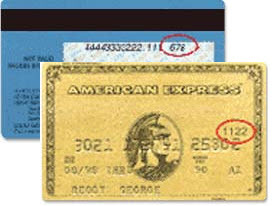 We use Card Verification Value Codes (CVV2) for “card not present” purchases. As a result, all online purchases from Ancestry will require this additional information to ensure that the person using the card has actual possession of it. We have a team of experienced analysts who are dedicated to preventing fraud on our websites and assisting users with any problems or concerns they may have. If you have concerns, please contact us at fraud@ancestry.com or through https://support.ancestry.co.uk/s/contactsupport. We use industry-standard encryption methods, such as using Transport Layer Security (TLS) during transit of subscriptions, orders, and credit card details to protect payment information. Who can see my DNA results? Your DNA results are viewable to you, and also to your DNA relatives if you have opted in to seeing and being seen by them. Also, your DNA relatives will see your common ethnicity or your whole ethnicity estimate if you choose. Please note that your DNA relatives are Ancestry users that we believe are related to you. When you decide to see your relatives through AncestryDNA, your information will also be viewable to them. You should know that you might find a long-lost relative or you might find relatives that you did not know about or that are surprising to you. You could also find that someone you thought was related to you is, in fact, not. These aspects of DNA testing are all part of what makes us human, although some may challenge our visions of ourselves. It is important to us that you feel safe communicating with other members of the Ancestry Community, so we’ve created an online messaging service that lets our users contact each other. When another user sends you a message, you’ll receive an alert in your Ancestry inbox and an email. You can respond through the Ancestry website without sharing any personal contact information with the sender (except your username). Ancestry stores these messages as described in our Privacy Statement. When you are using Ancestry’s messaging system to send messages to other Ancestry members, they will see your online status. They will also see when their message was delivered to you and read by you. 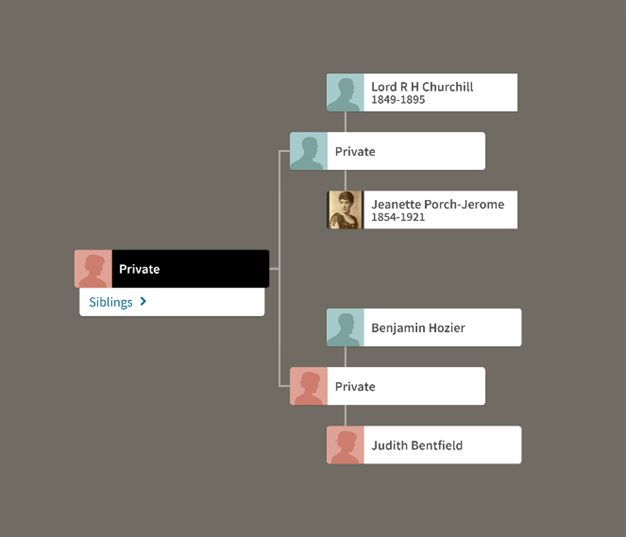 When you create or upload a tree to the Ancestry Community you can determine whether it is public, private, or unindexed. By default, your tree will be public, because we believe that this will better help you find family members and share your family history. You can change this setting any time to a more private option by clicking “Trees,” choosing a family tree, and then selecting “Tree Settings”. When you change your public tree to “private” or “unindexed,” other users may continue to see your tree until we can complete your request, but they cannot access any record or document from your tree without your authorization. Other users cannot view the contents of your tree. However, limited information about deceased individuals in your tree (name, birth year, birthplace, and any documents you upload) will appear in search results within Ancestry Community sites. For example, if you upload a picture of a deceased family member to a private tree - while no one can view that picture from your private tree, search results for that individual might show limited information for the uploaded photograph (such as the name of the picture and the ancestor the image is tied to). If the searching party then tried to view the photograph from the search, the site would tell them that the image is in a private tree and that they would have to contact that user directly to view it. A user could then contact you anonymously through the Ancestry messaging service, and you can decide whether or not to respond or give them access. What happens when I share my tree? *Note: The Editor role can always see information of Living People in the tree. Regardless of the role you assign, no one else can delete or rename your tree, change tree settings, or invite others to view your tree. And you can change who can see living individuals at any time. Please note that you are responsible for ensuring that the living people in the tree that you want to share have consented to have their information shared. If necessary, you can revoke someone’s invitation to view your tree. 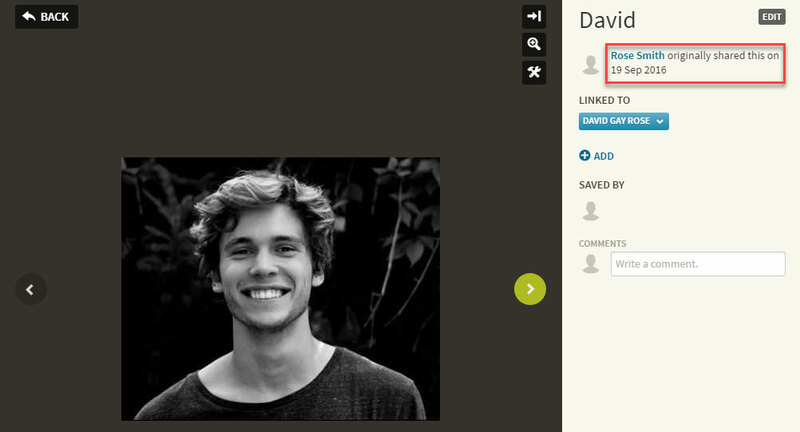 To do this, select your family tree from the “Trees” button at the top of any Ancestry page, then choose “Sharing”. Then simply click the “Remove” link next to the appropriate individual. 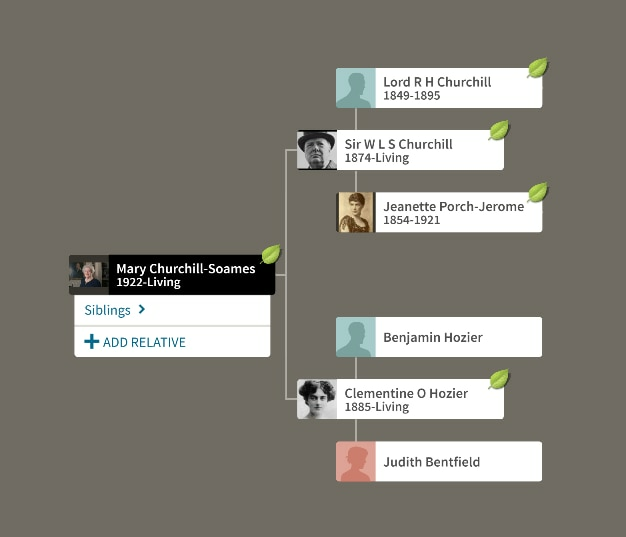 Who can edit content in family trees? You control the content in your tree. You can update or delete facts and photos or change the content at any time. However, once something has been added to a public tree, the content may be copied and re-posted. If you delete an item in your tree, it may still be displayed in another user’s tree. Because of this, we encourage you to think carefully about what you post and share within the Ancestry Community. Ancestry may market to you online, via email, or through other methods, with new products and offers from us or our business partners. This includes advertising personalized to your interests. You can control how we market to you by using the unsubscribe link in any email you receive, by changing your account preferences, or by following the instructions in any other marketing communications you may receive. Targeted ads placed on our behalf contain information on or near them about the third-party delivering the ads and how to opt out of receiving similar ads from that party. If you wish to not have this information used for the purpose of serving you targeted ads, you may opt out by clicking here. Please note this does not opt you out of being served advertising and generic ads will still appear on our websites. For more information about opting out of targeted ads from other advertisers, such as Facebook, please see Cookies and Advertising.